ADLB is a software library designed to help rapidly build scalable parallel programs. The name (pronounced adlib) is the acronym for Asynchronous Dynamic Load Balancing. However, ADLB does not achieve scalability solely by load balancing. It also includes some features that exploit work-stealing as well. Indeed, we sometimes use the phrase instantaneous load balancing via work-stealing to describe ADLB. ADLB will be available under the same license arrangement as MPICH2. There are features of ADLB that are reminiscent of a variety of other systems, e.g. Linda. However, ADLB is significantly different and unique in a number of ways. However, one is forced to accept the fact that such an approach is not likely to be very scalable due to the probable bottleneck caused by slave ranks trying to access data on the shared queue which is managed by the master. However, even in that case, it is possible for the shared queue to become a bottleneck if the shared queue requires synchronized access. From the user's perspective, ADLB is relatively trivial to use. Any process can simply do a Put operation to place data into a shared space, and any process can later Reserve then Get that data. Thus, the typical mode of operation is for an application to treat the shared space as a repository for work units. Arbitrary processes can add work to, or retrieve work from, the pool as needed. In support of the basic operations, there are additional provisions to provide enhanced functionality. For example, when data is Put into the shared space, it can be marked as targeted for (only reservable by) a particular rank. There are also some special operations designed to boost performance as well as to gather statistical information about a run. ADLB assumes the presence of MPI. For example, in the current implementation, the app is responsible for performing the MPI_Init operation before ADLB_Init. Further, ADLB uses MPI ranks to identify processses. This procedure must be called early, before any other ADLB routines. This procedure places a data/work packet into the shared space. It can optionally specify information such as whether the data is targeted for Reserve by a particular rank or if it can be reserved and retrieved by any rank. 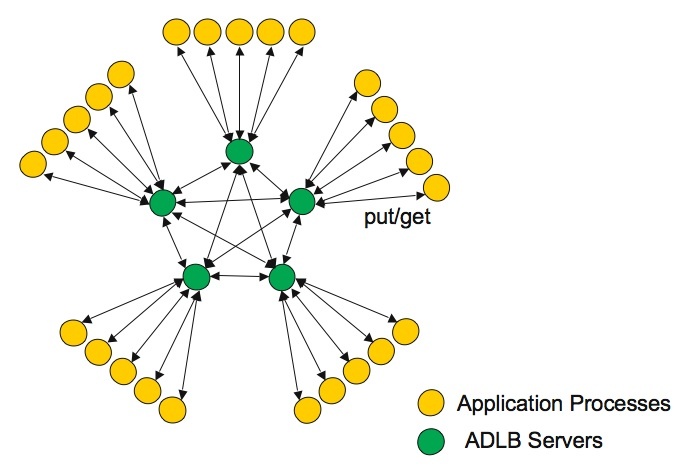 A Reserve operation requests that ADLB reserve a data packet for the requesting app rank so that it can later do a Get operation (which will remove the data from the shared space). There are arguments which permit the app to specify the type of data packet that it wants to reserve; this can range from a packet of one particular type, to one of several types, to a wildcard argument requesting any type. Among the returned items are a handle which can be used in a subsequent Get. Perhaps the most important returned items however are the type of data reserved and the length of the data packet. The length can be used to allocate a buffer before doing the associated Get operation. A Get operation is used to retrieve a data packet that was previously reserved. While Get is generally used almost immediately after Reserve, there is no actual requirement for doing so. Get causes the retrieved data to be removed from the shared space. This procedure must be called at the end, after all other ADLB routines. Currently we support an API for C and Fortran programs. Thus, below we follow the format of some of the MPI documentation providing both the C and Fortran prototypes for each function. This function must be executed by all processes before any other ADLB functions. nservers indicates how many processes should become ADLB servers. use_debug_server indicates if the last rank should become a debug server. aprintf_flag indicates if aprintf's should print; usually used for printing internal info by adlb itself. am_server will be set to 1 if the calling process should become a server, else 0.
am_debug_server will be set to true in the rank that should play that role. type_vect contains an entry for each type the app may Put. At initialization, the app must provide to ADLB a vector of all the types of work that it will Put into the work queue during its life. This permits ADLB to do some planning, error checking, etc. ntypes provides the length of that vector. app_comm is a new MPI communicator that processes should use for communications instead of MPI_COMM_WORLD. Many programs do not perform communications other than making calls to ADLB. Nonetheless, app_comm can be used to do MPI calls such as MPI_Comm_rank. This function must be executed by those processes that are to become ADLB servers. They stay in ADLB_Server until the program is ready to end, and then they must do ADLB_Finalize (and MPI_Finalize). malloc_hwm specifies the max amount of memory the app would like for the server to use. This can be useful if the server shares memory with some app ranks. Also, the server uses it to set thresholds for when to push data, etc. periodic_log_interval specifies how often, in seconds, we wish to have adlb log periodic stats. If 0.0, then NO logging is done. These two functions may help enhance performance if an app calls them before and after a collection of Put operations that are all performed at about the same time. Put work into the queue. work_buf points to the work itself. work_len is the length of the work in bytes. target_rank can be -1 (wild card) if the work is not targeted to any particular rank. If >= 0 it will not permit any other rank to reserve the work. answer_rank is used by some applications to indicate which rank is interested in the results of computations from this work. work_type is set by the app but must be one of those registered at Init. work_prio is determined by the app. ADLB makes a non-exhaustive attempt to retrieve the highest priority work later. Reserves work but does not retrieve it. This is useful for finding out how big a piece of work is and allocating buffer space before the actual retrieval. This call hangs until either work is retrieved or ADLB_NO_MORE_WORK is returned as the return code. req_types is a vector of up to 4 types (currently) that are ORed together. ADLB will return the highest priority work of one of those types that it can find (quickly). work_type is set to the type of work actually reserved. work_prio is set to the priority of the work reserved. work_handle is set to a value that is used to retrieve the work later. work_len can be used to allocate buffer space before doing a Get operation. answer_rank tells which rank to send answers to (or reserve them for); not necessarily used by all apps. Same as Reserve, but does not hang. Use a handle obtained during a previous Reserve/Ireserve to retrieve the work. Once this function is called, ADLB starts returning ADLB_NO_MORE_WORK return codes for Reserve, etc. This function should be called after all other ADLB functions to finalize operations. It must be called before MPI_Finalize. This function can be called to abort the program. It tries to get the servers to print final stats data. Then, it calls MPI_Abort on MPI_COMM_WORLD with the same error code. You can view the ADLB trunk from read-only svn: here. We also try to keep an up-to-date tgz here: here. The companion software (DMEM) can also be downloaded here: here. Note that since ADLB is still very much in development mode, there is currently no install target. You have to either work in the ADLB directory, or move the libraries to a directory where you want them, or create a Makefile elsewhere which points to the ADLB libraries. This causes the file configargs/sicortex.cfg to supply arguments to the configure script. You can create your own customized configure options files specific to your own environment. The first execution of nq prints the 2 solutions to a 4x4 nqueens puzzle. The program stalls for about 5 seconds, because nq halts only when ADLB has determined that it has reached exhaustion, i.e. no more processes are going to do any Put operations because they are all waiting for Reserves. At present, ADLB prints quite a bit of information at the beginning and end of each run. We will reduce the output later when we enter a production mode. The second execution of nq runs 10 processes. Two of them are ADLB servers, and the remaining 8 are nq app ranks. The -n argument to nq says to do a 9x9 board puzzle.